It's not often you can say that a football shirt is so good that it prompts a number of later tributes to be released, but that's what we have here. France's home shirt, most commonly associated with their winning Euro 84 campaign, was rubber-stamped as a classic when its national team finally staked its claim to be one of the best in the world, and with good reason. This was unquestionably one of those moments when you wondered why a shirt with just a few simple elements hadn't been thought of before. 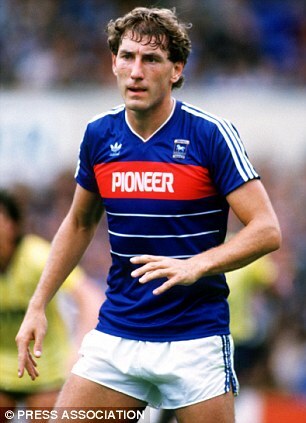 It is, at the end of the day, just a blue shirt with one broad red stripe, three thinner white ones below it and three more along the sleeves (as seen on all adidas shirts at the time). So why is it such a beautiful thing? Perhaps it's that red stripe - the first time red had ever been used on a France shirt as a bold feature in its own right (save for a bit of trim on the collar in the late-'60s/early-'70s). Perhaps it was the three white stripes below - sweeping away the pinstripes of previous shirts with a simplified, bolder look, rotated through 90 degrees. More likely, it seems, it was the sheer fact that the twin-colour twin-thickness nature of the stripes had never been tried before, let alone designed with such panache. French football was undoubtedly on the rebound in 1984. The national side was growing with stature as, from the late 1970's, an increasing number of talented players emerged and coalesced into a team capable of playing exceptionally beautiful football. In the 1982 World Cup, France reached the semi-finals, but in the European Championships they hosted two years later, they won the competition outright. They did so playing the same brand of elegant football, and this time, wearing a shirt that was the envy of every other team. With a small winged collar in blue and the classic FFF badge proudly sat on the red stripe, this was a design that reinforced the bleu-blanc-rouge national colours at the perfect moment in time. Even on the white away shirt (where the main stripe was blue above thinner red stripes below), no sense of elegance was lost - in fact one wonders why many other teams didn't apply their own colours to such a strong template. It's not illogical to suggest this must have been a bespoke design created specifically for France by adidas, and if that's true, you'd have to say the exclusivity was worth every franc. Such was the synonymity with greatness that this shirt had, it was no real surprise that someone somewhere used nostalgia to bring it back to life several years later. It finally happened in 1998 when France hosted the World Cup, and incredibly even this adidas homage was forged with glory as the likes of Blanc, Deschamps and Zidane lifted the trophy for the first time in the country's history. Knowing a good thing when they saw it, adidas retained the classic red stripe from the '84 shirt and used it again and again. 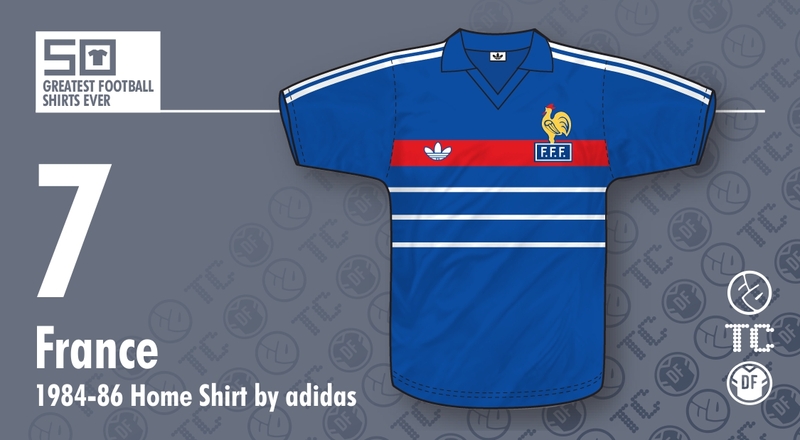 It appeared in a stylised, reinvented form on the France shirt for Euro 2000 (another win), Euro 2004, Euro 2008 and World Cup 2010 (the last adidas shirt before Nike replaced them in 2011). Notable these days by its absence, it became almost an essential element of many France shirts over a 25-year period. The irony, however, is that the original classic version from Euro 84 was only ever worn in just 14 matches. It didn't even last two full years of service - a scandalous waste for a shirt that's as recognisable as any other in our 50 Greatest Football Shirts countdown. As PT Barnum once said, though, 'always leave them wanting more'... and when it comes to quality design like this, we can never really hope to get enough.